Ensemble LPR Leads The Charge for Cultural Relevance. Last night, I was a very lucky arts blogger. We seek out material that fits the mission of our blog, but not often does a performance, or performer, or organization cross our path that completely fits our personal aesthetic as well as our own artistic mission. The preview concert performed by the new Ensemble LPR last night (at Le Poisson Rouge) was a pleasure to review. One major purpose of this blog is to profile and review performances that uphold Tuxedo Revolt principles of performance innovation. So if you didn’t get to attend last night—I’ll tell you all about the performance, and why you should care. Who: Ensemble LPR, led by Tito Muñoz and Daniel Hope, soloist. What: The music of Max Richter featuring Richter’s Vivaldi Recomposed: The Four Seasons (2012) (U.S. premiere), and Richter’s INFRA (2010) (U.S. premiere). 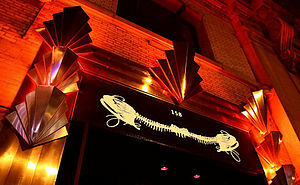 Where: Le Poisson Rouge, 158 Bleecker Street, NYC. In a previous post, I described a little bit about the venue of Le Poisson Rouge. As I took my place at a table in the back of LPR, ordered my glass of wine, and began to settle in—I realized that Le Poisson Rouge is a bit like an empty vessel, ready to take on whatever art is there to fill it up. As I was waiting for the concert to begin, I opened my mind to interpret the music that was to follow. As a creative rebel, I was delighted to read this public statement. It was a bold move, artistically aggressive, and spoke volumes about the mission of Ensemble LPR. The musicians took the stage and David Handler made a brief introduction. Then, it was all Ensemble LPR. Tito Muñoz led the Ensemble in the music of Max Richter. Muñoz led the ensemble with precision and through his gestures, helped to highlight both Baroque and Modern elements in Richter’s score. Richter’s Vivaldi Recomposed: The Four Seasons was deserving of its own blog post. I wondered how this piece was going to work—Vivaldi? Baroque music? Reworked? What? How would that be relevant? Needless to say I was intrigued. Richter did an amazing job of reviving and infusing new life into a work that is approximately 289 years old. Richter blended in electronic sounds, amplification and technology into the original score. Richter deftly reworked rhythmic and melodic elements from the Vivaldi original to give a fresh, 21st Century perspective to the piece. I sensed influences of electronic music, dance music, and possibly world music. Recomposed was an interesting cerebral experience as well. It was as if we, as a collective audience, were trying our best to remember Vivaldi’s Four Seasons, but somehow we fused it to the songs and music we experience in our everyday lives. Not because we couldn’t remember only one or the other, but because we love both kinds of music so much. The experience was truly unique. Daniel Hope, the solo violinist, played a special role in the performance. I tried for a moment to put myself into his shoes. As the soloist with Ensemble LPR, an ensemble focused on cultural relevance, Howe became an extension of the Ensemble’s mission and thus a bridge to the audience. From his performance, you could be easily perceive his awareness of this responsibility. He played with great sensitivity and he filled Richter’s creation with the same artistry he would have used if playing the Vivaldi original. Howe’s playing soared from the violin and filled the space, captivating us in a moment shared together. Happy holidays, and I’ll be back in 2013. Introducing Ensemble LPR & How Creativity Never Sleeps. The New York Times calls it “…an epicenter for adventurous music…” Manhattan Magazine proclaimed, “Every other venue should pay attention to what these guys are doing…they absolutely get it.” So, you’d think that after simultaneously setting the music world on fire whilst turning it on its head, Le Poisson Rouge (LPR) co-founders David Handler and Justin Kantor might be ready to take it easy and enjoy LPR’s (freakishly immense) success. It turns out that isn’t the case at all. In an interview last month with David Handler, Tuxedo Revolt discussed the evolution of the original idea shared between Handler and Kantor. We also explored the exciting plans for LPR’s latest and greatest creative endeavor—one that you won’t want to miss out on. “(Le) Poisson Rouge is a multimedia art cabaret founded by musicians…(and is) dedicated to the fusion of popular and art cultures in music, film, theater, dance, and fine art. The venue’s mission is to revive the symbiotic relationship between art and revelry; to establish a creative asylum for both artists and audiences. “ —And this LPR has done, astonishingly well. Since our interview, I’ve thought about that singular statement quite a bit. Why do we seem to polarize into one camp or the other? The world is teeming with billions of people, and millions in New York City alone. Why should anyone have to choose sides? Why not take it all in? When you begin to let down your defenses and or artistic prejudices as David suggests, you open yourself up to new inspirations and new art. Humans are social creatures. Why not mix socialization with live music and art? Why not make the viewing or listening space for a work of art a party? Why not mix the old withthe new? The challenges that LPR poses to our artistic beliefs are the earmarks of innovation. David Handler and Justin Kantor are exactly just that, innovators. They are now ready to expand the artistic scope and depth of the LPR mission. This month, David and Justin along with co-Artistic Directors Orlando Alonso and Ronen Givony will present a preview of the latest and greatest idea fresh off the drawing board….get ready for it: Ensemble LPR conducted by the legendary Tito Muñoz. If I was passing out all-star awards for organizations in the arts world that upheld the Tuxedo Revolt core ideals of performance innovation integrated with cultural relevance— Le Poisson Rouge, and its cofounders David Handler and Justin Kantor, would be first and foremost among them. If you’d like to hear the complete Tuxedo Revolt interview with David Handler, stay tuned for the official Tuxedo Revolt podcast to follow soon. Stay tuned and be sure to check out Ensemble LPR on Dec. 19th and 20th New York City.